The generator unburned hydrocarbons emissions factor is the amount of unburned hydrocarbons emitted per unit of fuel consumed by the generator. The actual quantity of this pollutant produced by the generator depends on the fuel, engine design, and operating conditions, including the power output of the generator. For simplicity, HOMER assumes this factor is constant. 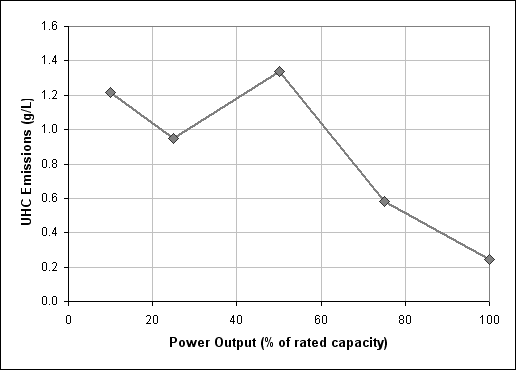 The following graph shows the value of the unburned hydrocarbons emissions factor for 50-kW–450-kW diesel generators. The source of these data is an internal NREL report by Erin Kassoy entitled "Modeling diesel exhaust emissions in diesel retrofits." The default value for the generator's unburned hydrocarbon emissions factor is equal to the average value between 50% and 100% load. HOMER uses this value to calculate the emissions of unburned hydrocarbons and carbon dioxide. For details, see the How HOMER Calculates Emissions section of the help.